On August 23, the Chicago White Sox Volunteer Corps came to Park Lawn to help build flower planters, benches, bean bag game boards and visit with Park Lawn Program participants. The White Sox Volunteer Corps started in 2009 in response to President Barack Obama’s national call to service. It consists of 5,000 White Sox fans and employees who offer their time to local service projects throughout the year. The White Sox Volunteer Corps were united with Park Lawn through Chicago Cares, an organization that works to gather groups of volunteers and connect them with organizations. 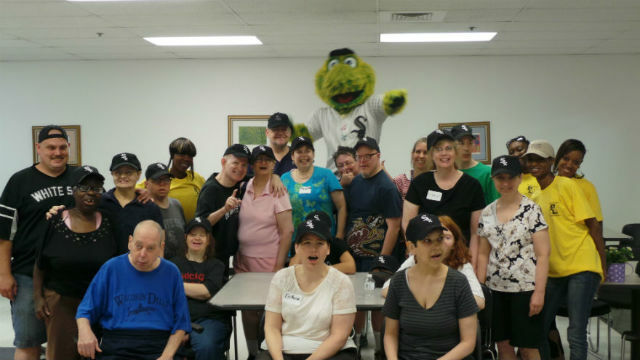 In addition to the construction work, the Chicago White Sox and Chicago Cares set up and ran a small carnival for Park Lawn Program participants. The event included games, prizes and a visit from Southpaw, the White Sox mascot. Park Lawn would like to thank the Chicago White Sox Volunteer Corps and Chicago Cares for their volunteerism.